A veiw of sunset in downtown Manhattan from Jersey City. • Every tree has its own little fence. • Blackend gum stains on sidewalks. • Gates, fences, buzzers, locks. • Cafe’s rarely have outdoor seating. this ain’t Europe. • All buisness in the streets, but you do find people being quite friendly one on one in shops. • Art Galleries have equal amount shlock to good work as most American cities (keep in mind, just because it is here, doesn’t mean it’s good), New York has volume though; in spades. • Expensive things, food, life. • Fancy brand names, but brand names just the same. • People like dogs, no matter how small the space they have. • A television for every resturaunt or cafe. • Hot dogs, soda, or pretzels on the corner. • An advertisement for a cable show on every bus. • All languages spoken here. • The museums are going to cost ya. 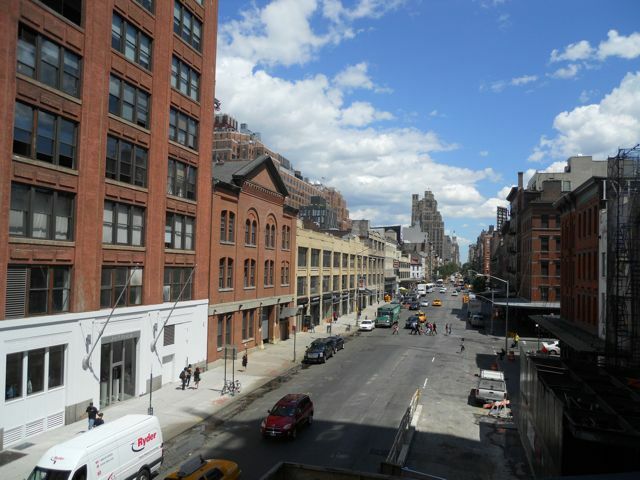 A view from the highline park in Chelsea. A park not to be missed when you are in NY it is actually an old freight rail road line they have made into an above ground walking park. 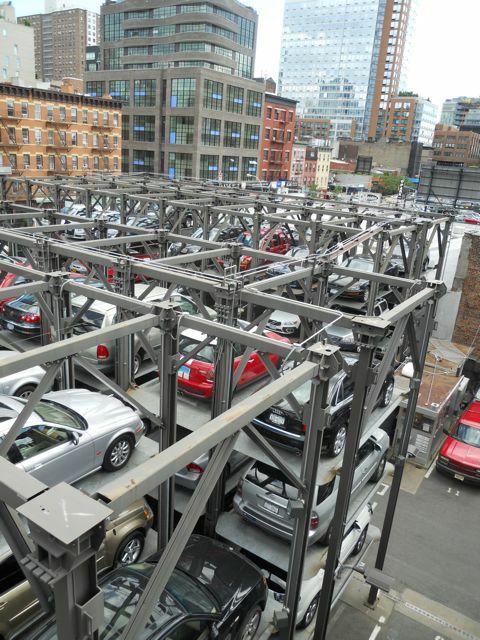 Some parking options in New York city seem to require some creativity. This one just made me nervous to look at. This entry was posted in Interesting.... and tagged facts about New York, New York art, Observations in New York. Bookmark the permalink.